It’s here! Available in paperback and digital is DEVOURED UNIVERSE. Beyond the farthest reaches of the universe lies a threat to the very existence of reality. When Earth receives a signal from deep space, they must embark on a dangerous mission into the unknown. Gordon Lightcap returns to duty after a brief retirement. He will have to use what he has learned to bring together a mismatched group of astronauts, and discover the secrets to existence. Only then will they be able to prevent the annihilation of everything, but at what cost? FLESH AND LEFTOVERS audiobook available! After months of work it has all paid off. My zombie novel, FLESH AND LEFTOVERS, is available in audiobook format. The audio conversion features some bonus content and is perfect for those of you whose schedules would prefer the listening format. It features 13 tracks and just under 7 hours of flesh devouring madness. While the print is still available on Lulu.com and the kindle on Amazon, the audiobook is available in multiple markets. Check ITUNES, AUDIBLE and AMAZON for your copy now. This is where the journey all began, and it continues to become a fan favorite saga. Pandora’s Box has been opened. Now humanity must face its darkest battle yet. The archangels of virtue and the demons of sin have come choose earthly hosts. It is a race against time for the legions of Heaven as they try to find the Sword of Eden. At the same time, the denizens of Hell attempt to locate the Spear of Destiny. These two artifacts could decide the war’s true victor. While these gods fight for their own agendas, Gordon Lightcap must send his team of elite specialists to find what he believes will be the only thing that can save the human race. The decisions made by humans will be crucial to the forces of Light and Darkness. Will the residents of Earth be virtuous, or will they give in to the seven deadly sins? Each entity within will literally take the reader to heaven and hell, and back, as well as a close look at the true horror of it all. 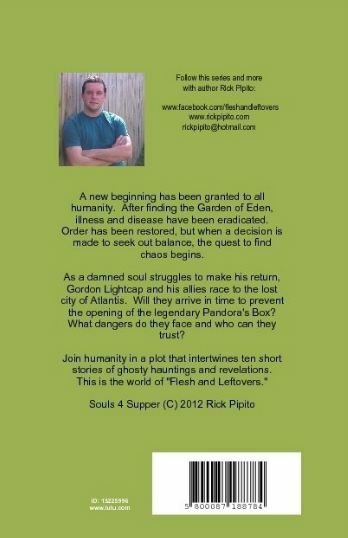 The following is an interview with author Rick Pipito about the novel Souls 4 Supper. Q: This is the fourth book in your Flesh and Leftovers series. Has it gone as expected so far? Rick: The series has been great to me. I’m still looking for that break out moment that will let me do this for a living, but until then I will continue to evolve my characters and stories. I’m a firm believer in creating something for everyone. That is what this series is about. Yes, it is horror, but the stories cover such vast territory. I guarantee if people heard more about it, they would find it much more interesting than just “any horror”. Q: Did you follow the same format for book 4 as the others? Q: So even though this is book 4 it can also be read to newcomers as a book 1? Rick: Absolutely. I know from my own experiences that if I’m behind in something I don’t want to have to start from the beginning (especially with books). I still want to know everything that happened, but just enough to catch up to the rest of the readers. Souls was written with that in mind. The first trilogy is complete. Now the second one begins. It can be read as a stand alone trilogy, but I’m hoping that readers of Souls 4 Supper and the following 2 novels will want to go get the first trilogy to see how it began. Q: You’ve done Zombies, Vampires, Werewolves, and Ghosts. Where do you go now? Rick: The next logical step for me was to tackle the afterlife as an entirety. Heaven and Hell battling it out. In book 5, demons and angels invade the earth realm and consider their eternal war more important than humanity. The intriguing part will be seeing how the humans will have to fend for themselves. Of course more mysteries of human past will be revealed as well. Q: There is a very big revelation in “Souls 4 Supper” with the backstory of M.U.T.S.. Do you plan on getting into more depth with that? Q: Do you have any favorite Ghost stories that are not your own? Q: Which chapter in Souls was the most difficult one to write? Rick: Monster Weekend was the most tasking chapter. It was based on my experiences from when I was a Boy Scout, but transferring it from my mind to paper and making it interesting to the reader was a challenge. Of course, the ghost element wasn’t really there when I was young, but we constantly talked about ghost stories around the campfire, and all of the other elements in the story happened to some extent. Q: How do you go about tying all of these together, and still have a load of surprises in the main plot? Rick: The stories themselves are simple. I have them mapped out in my mind and on paper. This is the same with the main plot. The challenge is when I’m trying to segue from each part and make it flow well. In other words, even though I have it all figured out before hand, I don’t know which order the chapters will go in until I’m actually writing it. As far as the surprises, I’ve always been fascinated with mysteries of the world. The fact that many are unsolved gives me a desire to try to explain them in a sense. I think it is also a good way to connect the reader to the events in the novels, because they know what I’m talking about. Q: What a cliffhanger, but the story is still wrapped at this point. Cain, S.H.A.N.E., heaven and hell? Can you tell us anything else about what will happen? Rick: <Laughs> You want me to tell you the whole book? No, I can’t say too much, but I will tease that Cain will do something no one ever thought possible, and will be considered EXTREMELY controversial. S.H.A.N.E.’s fate is a buildup for book 6, so I can’t say more at this time. Everything else you will have to wait and see. Q: You didn’t have the timeline in back of this one, as you did in book 3 and the Eden’s Order trilogy. Why not? Rick: I will have the timeline reserved for the back of the second trilogy. I’m trying to establish this trilogy as a standalone as much as possible, so even though the first trilogy is part of this new one, I still want to keep them separate with the timeline until I use it as an extra for any buyers of the trilogy collections. The only down side is that it is a ways off before we will see another trilogy collection. Q: Did you create the Atlantean alphabet? Rick: All of the interior art this time was done by myself. The angelic symbol was a recreation of what exists in texts and research, but the alphabet was my design, yes. It is said that Atlantis was a society based on science and math. I designed the alphabet in that manner. It is simple, but is also supposed to be the origins of all known languages on earth. There is a hidden message in the back of the book too, just to make it a little fun. It’s nothing big, but gives the reader a little puzzle to solve. Q: There are parts in Souls 4 Supper that are controversial at times. What is it like to write something like that? Rick: I’ve done it before and I’ll do it again. Other than the religious elements in Souls, the only thing that really stands out to me as controversial was the story about Monster weekend. My mother didn’t understand why I had included some of the dialogue and interactions. She also was never a teenage boy. The guys that age at that time always talked like that. Friend’s mothers were often targets of insults and jokes. I expect criticism and there are going to be people that don’t like certain aspects or crossings of the line that I take. Especially when it comes to religion and science. Any publicity is good publicity though. I want people to talk about it, so the name becomes familiar. Q: Dan took a different approach for the cover art this time. Was that your decision or his? Rick: My brother is part of my inspiration for writing a certain way. I gave him an idea for this one that would have stayed with the theme from the first three novels, but since it was a new trilogy, Dan really wanted to make it a new series of art. He really has had the final say in what he is doing for each cover. I don’t want to limit his art talents and creativity by telling him to do something. I feel that his own ideas really represent not only his skill level, but also the way a reader may interpret the stories within. I actually redesigned some of the tetrahedron of Pandora’s Box based on Dan’s art concept for it. Q: Speaking of support and inspiration, you dedicated this book to www.homemadedelish.com. Does your wife give you additional inspiration? Rick: Of course. She keeps me on my toes. Her input is very valuable to me, not just from a husband stand point, but from a fan point of view. Roberta is very critical, and tells it how it is. If she thinks an idea won’t work, she will tell me. Of course, she is always the first to say “Wait a minute. What’s next?” So, even she doesn’t know what I have going on in my head for future installments. In a way, she is as eager as I am for the next release. Q: In chapter 6, the plot points are based on an urban legend. Could you elaborate on what made you go that route and how much of it is real versus fiction? Rick: I knew that the novel would be released sometime around Halloween, so I really wanted to use that to my advantage. There is this story that I hear every year about a haunted house where you pay a certain amount of money to get in. If you make it through 13 floors, then you get a dollar back per floor that you make it through. I had to research this. It took me hours to do and hundreds of websites, but the overall conclusion is that it is an urban legend. I hid a few things in here as well. As far as the title of the chapter, “The House On Shadybrook,” well, I grew up on Shadybrook Lane. That is when I first heard about this legend. I also threw in a few other easter eggs of sorts. For example, the article in the story mentions someone’s screen name as “Redeemerxx.” That is my x-box gamertag. There is also a hint at what is to come in book 5, as well as the town of Pipville, which is just a creation of mine. And of course I mentioned my sCrypt Comics blog as well, in the hopes that people will be curious to see if it really exists. Overall, it was a lot of fun to write. Q: What will the sCrypt Comics graphic spinoff be called? Q: Continuum was mentioned in this novel. Wasn’t that your first novel idea? Rick: Yes. “Continuum: The Fight For Humanity” was a sci-fi novel that I wrote back in 2000. I never published it, because I didn’t feel it was up to par, but I did copyright it because I knew it was a good concept. Recently I decided to make it tie in to the Flesh and Leftovers universe, but only as a set of book ends. There are 9 novels in the series planned. Continuum is being edited and altered to fit into this universe as a prequel and sequel. It will be book 0 and book 10 in 1 book because it takes place far in the future and at the dawn of man. The decision just seemed logical to me, and I’m excited to share it. Q: Do you have a projected release on the next novel in this series? 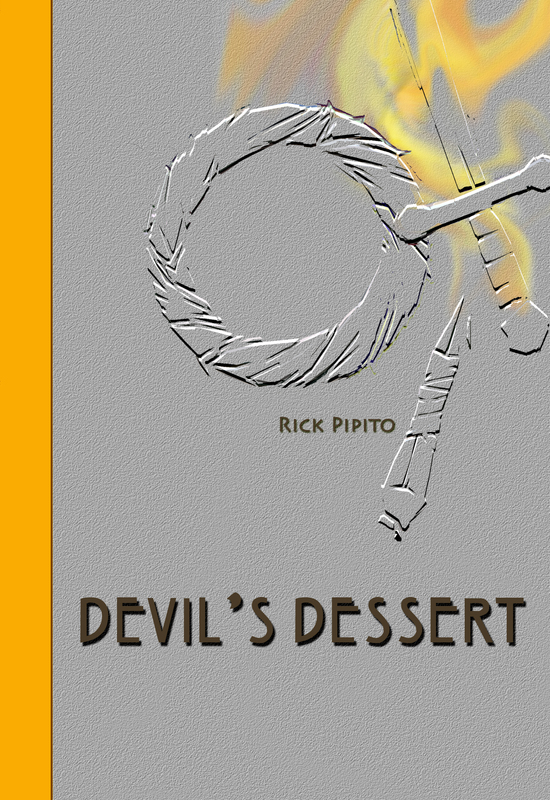 Q: So “Devil’s Dessert” is the title for book 5? Sounds enticing. How about any major publishers for you or Hollywood prospects? Rick: It’s funny you ask that. My trilogy was in Hollywood for review by a movie maker. The studio read it and loved the whole thing. The project was then denied for a movie. My contact there told me these exact words, “They feel that justice can’t be done to the books unless it was a television series.” Apparently there was too much content for a two or three hour movie. I agree. I’d love to see it as a series. Each novel would cover enough content for a season a piece. Now if I can only get someone with funding to take interest, well the thought is exciting. Q: What other projects do you have in the works? Rick: Aside from the next comic book and next novels in the series, I’m also working on a book of my poetry from over the years, as well as another “No, It’s Not. Yes, It Is” book with Urban Legends being the focal point. Q: Where can I get a copy of “Souls 4 Supper”? Rick: It is available on www.lulu.com in softback print, as well as on www.amazon.com for your Kindle. Q: Is there anything else that you would tell this audience about this series? Rick: <smiles> Sure. Whether you start with book 1 or book 4, if you haven’t read this series, you’re missing out. The more people that support independent writers like myself, gets the major publishers and filmmakers to take interest. So, whether it is me or some other author trying to make it in the business, support us if you can. I appreciate and love all the fans of my novels, and hope to meet some of you in person one day.